Iran’s professional football club Esteghlal has managed to notch up a well-earned victory over arch-rival Persepolis at the end of their 84th face-off in the Iranian capital city of Tehran. Alireza Mansourian’s blue-clad men could defeat the Reds 3-2 in an exhilarating match officiated by internationally recognized football referee Alireza Faghani, and in the 21st week of Persian Gulf Pro League, which is the highest level of the Iranian football league system. The game kicked off at 3:08 p.m. local time (1122 GMT) at Azadi Stadium, western Tehran, on Sunday. Persepolis footballers got off to an encouraging start despite the chill in the air, and ran the ball down the other side of the field immediately after the opening. The Reds’ midfielder Mohsen Mosalman sent a left-foot volley on the opponents’ goal in the fifth minute. His teammate Soroush Rafiei was agile enough to collect the ball, and score the opener. Esteghlal found a marvelous opportunity five minutes later, when Persepolis defender Hossein Mahini lost possession of the ball. The Blues simply squandered the chance though, and Persepolis forward Mehdi Taremi struck a header that went over the bar. It was in the 17th minute that Persepolis made a ghastly mistake, and created an excellent opening for Esteghlal midfielder Farshid Esmaeili to penetrate and tack the equalizer. The Blues’ celebration to draw level with the Reds had not subsided, when forward Ali Ghorbani doubled Esteghlal’s lead in the 20th minute with a header. Persepolis footballers then created several clear chances but failed to score. Taremi flicked a header in the 30th minute that missed by only a short distance. Ten minutes later, Persepolis defender Ramin Rezaeian hit a free kick that overshot its target. In the dying moments of the first half, Esteghlal midfielder Omid Noorafkan lashed a volley at teammate Kaveh Rezaei, who sent the ball past goalkeeper Alireza Beiranvand and into the back of Persepolis’ net. 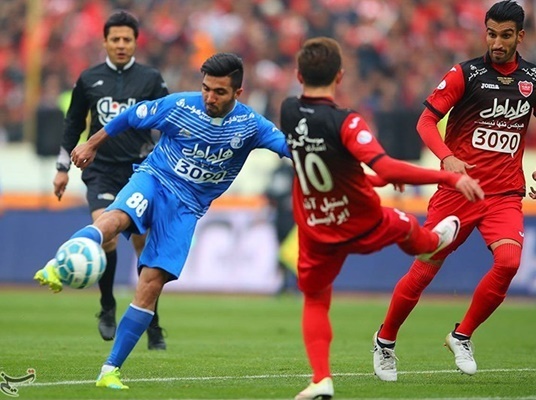 After the interval, Persepolis soccer players put Esteghlal’s goal under pressure to reduce the deficit. They even created several chances but lacked the cutting edge to get the job done. Persepolis captain Seyyed Jalal Hosseini finally pulled a goal back in the 93rd minute, before Esteghlal goalie Mehdi Rahmati was shown the second yellow card and subsequently sent off the pitch.